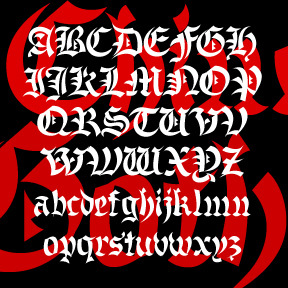 BENIGHTED is my stab at a blackletter font that has a loose, hand-lettered feel. Sort of an Old English Casual or Fraktur Frisky. I drew all the letters with a Sharpie marker (and I’m no calligrapher) and then autotraced them, arranging them along an uneven baseline. Includes upper and lowercase, numbers, punctuation, and international characters.